The report lays out a road map for how the military will adapt to rising sea levels, more violent storms and widespread droughts. The Defense Department will begin by integrating plans for climate change risks across all of its operations, from war games and strategic defense planning situations to a rethinking of the movement of supplies. Defense Secretary Chuck Hagel, speaking Monday at a summit meeting of defense ministers in Peru, highlighted the report’s findings and the global security threats of climate change. While foreign policy experts have for years warned that climate change could present a future risk to national security, the Pentagon’s characterization of climate change as a threat demanding immediate action represents a significant shift for the military. In the past, the Pentagon’s response to climate change has focused chiefly on preparing military installations to adapt to its effects, as in protecting coastal naval bases from rising sea levels. But the new report calls on the military to incorporate climate change into broader strategic thinking about high-risk regions — for example, the ways in which drought and food shortages might set off political unrest in the Middle East and Africa. As the Pentagon plans for the impact of climate change, it is conducting a survey to assess the vulnerability of its more than 7,000 bases, installations and other facilities. In places like the Hampton Roads region in Virginia, which houses the largest concentration of American military sites, rapidly rising sea levels have already led to recurrent flooding. The Pentagon report is the latest in a series of studies highlighting the national security risks of climate change. A May report by a government-funded research group, the CNA Corporation Military Advisory Board, concluded that climate change was becoming a catalyst of global conflict. In March, the Pentagon’s Quadrennial Defense Review, the agency’s main public document describing the current doctrine of the United States military, drew a direct link between the effects of global warming and terrorism. The new report does not make any specific budget recommendations for how the military will carry out its climate change agenda. If the Pentagon does request funding from Congress for spending on climate change initiatives, it will clash directly with congressional Republicans, many of whom question the established scientific evidence that human activities are causing climate change. Republicans have fought to block and overturn most of President Obama’s climate change policy initiatives. The Pentagon’s increased emphasis on the national security threats of climate change is aimed in part at building support for a United Nations agreement, to be signed next year in Paris, that would require the world’s largest producers of planet-warming carbon pollution to slash their emissions, while increasing aid to help the world’s most vulnerable populations adapt to the effects of global warming. At a December meeting in Peru, climate change negotiators from around the world will gather to draft that deal. 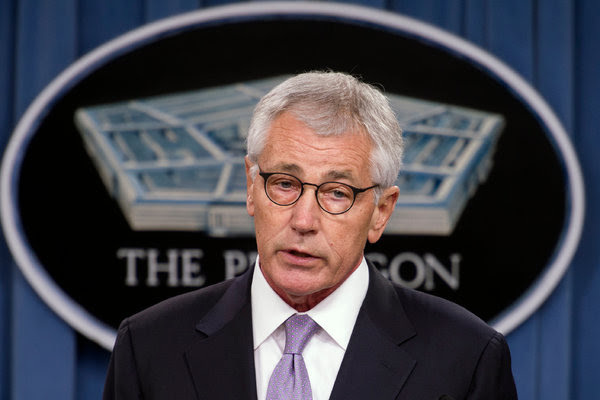 Mr. Hagel’s speech in Peru on Monday appeared intended to build support for that effort. In 1997, Mr. Hagel, then a Republican senator from Nebraska, played a crucial role in blocking the United States from taking part in the world’s first climate change treaty. He wrote, with Senator Robert C. Byrd, Democrat of West Virginia, a resolution ensuring that the Senate would never ratify the Kyoto Protocol, which required the world’s largest economies to cut their planet-warming fossil fuel emissions.